In the aftermath of the Rafale conundrum and the Balakot airstrike, the Lok Sabha election season is in full swing. For the voters, media and psephologists, it is hyperbole and rhetoric for the next 50 days. After the finalisation of the list of candidates, political parties are busy drafting their election manifestoes to lure the voters. But the most pertinent question that arises in the minds of ordinary citizens is about the role of governance in addressing basic rights. One such issue is the total failure of the system in dealing with builders and financial fraudsters, who, with substantial help from a section of incompetent and corrupt officials in banks, bureaucracy and politicians alike, have fattened their purses by swindling the tax payers’ hard-earned money. A few months ago, a home buyer, who was unable to sustain pressure from the bank due to the loan he had taken, committed suicide after being cheated by the Amrapali group. The Government machinery, too, has remained a mute spectator to this loot by builders. Sadly, no political party has genuinely attempted to take up the home buyers’ plight. It is in this context that it will be prudent to discuss one of the biggest thugs in present times, one who has been roaming freely in the National Capital Region, the chairman of the Amrapali group of companies. He has beaten all records of the popular conman Natwarlal by operating as a double dealer and has befooled home buyers and Government agencies alike. This dubious company has been in the limelight because the Supreme Court has taken up the cause of Amrapali Centurial Park and other projects and is trying its best to solve this issue. In hindsight, this case, if taken to its logical conclusion by the apex court, will rewrite the rules of governance for law breakers. But is it the court’s responsibility to do so? Is it not the Government’s responsibility to protect the genuine interests of law-abiding citizens? Thousands of home buyers in Noida and adjoining areas have been agitating for the past 10 years to get possession of their flats from this company but their voices have not been heard. The Government provided only lip-service to their woes. The three-member ministerial committee put in place by Uttar Pradesh Chief Minister Yogi Adityanath, too, proved to be a damp squib. Ultimately, the buyers found a sympathetic senior advocate in ML Lahoty and a dogged fighter from among the flat buyers, Amit Gupta, who filed a case in the Supreme Court. A Bench of Justice Arun Mishra and Justice Uday Umesh Lalit has been trying to nail the builder for the past several months. The top court has been hearing the case on priority, almost at an interval of a week to a fortnight. 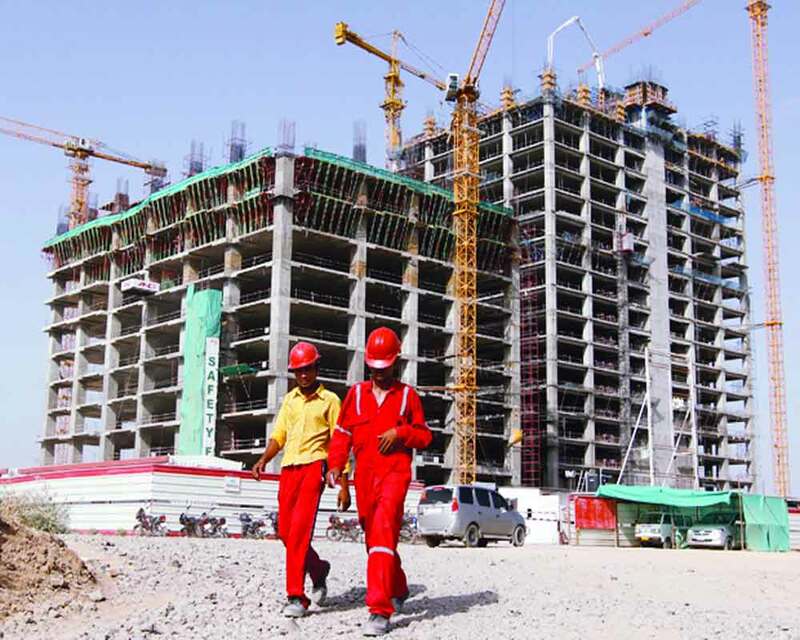 The court has even roped in the National Building Construction Corporation (NBCC), a Government of India public sector undertaking, to act as an agency to ensure completion of these projects. The NBCC has to now pool funds to make a start but as the situation exists, nothing much has been done. Due to cartelisation and back room maneuvering by Amrapali, no one is bidding for the court-ordered attached properties; though the court sent Amrapali chairman Anil Sharma and two of its Directors to jail. These tricksters mistakenly thought that they could tire out the judicial process in the same way they swindled the flat buyers in cahoots with a few corrupt politicians and relevant officials. It is surprising that Amrapali could divert Rs 3,000 crore of the homebuyers’ money as the final report by the forensic auditors said. The question now is: How was such a large amount of money siphoned off so openly? And how do we now deal with the situation? Rising cases of audacious frauds committed by the likes of Amrapali, Nirav Modi and Vijay Mallya have posed serious challenges to governance. Meanwhile, flat buyers have taken up their cause on social media and questioned the Government. The recommendations made by a committee appointed by the Ministry of Housing and Urban Affairs are gathering dust. As it is, it could not come up with any workable solution. In March, the flat buyers wrote an open letter to Prime Minister Modi, seeking his immediate intervention. The timing of the letter in itself is a grim reminder to political parties to commit themselves to the homebuyers’ cause as they have a voting capacity of more than one lakh in the Noida region alone. Further, they have forged a united forum for the election. They have openly declared that they will support and vote en bloc for any candidate who will take up their cause and ensure its resolution. So far, none of the mainstream political parties is willing. It is really surprising that when such a large votebank is there for the taking, nobody is bothered to act on injustice and tacitly agreeing to the continuance of crony capitalism. This is a very pertinent issue not only for candidates fighting election from Noida but also for the Prime Minister and other leaders. Following are a few suggestions that can solve the imbroglio. First, since Government land was involved in the building of flats, it must accept responsibility. The Supreme Court can, therefore, order the creation of a “stress fund” that can help complete the stalled real estate projects. The fund should be placed completely at the disposal of the apex court and ultimately, the NBCC. Second, either the Income Tax department or the Central Bureau of Investigation (CBI) should get to the depth of the matter and trace the exact location where the money was diverted. All assets, including benami properties, must be seized and taken over by banks or NBCC. Gradually, they should be put to a revenue generation module to retrieve the stress fund, if auctioning attempts do not succeed. Third, the Government should amend the Real Estate (Regulation and Development) Act, 2016 (RERA) and install adequate safeguards and punishment against fly-by-night builders as well as local agencies, like the Noida authority, who have been acting more like a business concern. Take for example the back- breaking exorbitant transfer fee being charged on flats and the registration charges. If the land is on lease and the flat has been registered as per the rule, what is the need for such heavy transfer charges? Only one charge should be applicable. In a nutshell, reforms that can have far-reaching consequences are the need of the hour. But the question is: Who will bell the cat? Until this is answered, people will continue to suffer.